Disability is a thorny and muddled concept - especially in the field of disability studies - and social accounts contest with more traditional biologically based approaches in highly politicized debates. Sustained theoretical scrutiny has sometimes been lost amongst the controversy and philosophical issues have often been overlooked in favour of the sociological. Arguing about Disability fills that gap by offering analysis and debate concerning the moral nature of institutions, policy and practice, and their significance for disabled people and society. This pioneering collection is divided into three sections covering definitions and theories of disability; disabled people in society and applied ethics. Each contributor – drawn from a wide range of academic backgrounds including disability studies, sociology, psychology, education, philosophy, law and health science – uses a philosophical framework to explore a central issue in disability studies. The issues discussed include personhood, disability as a phenomenon, social justice, discrimination and inclusion. 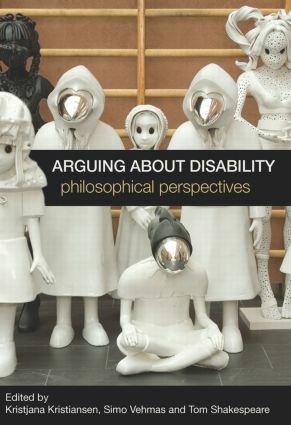 Providing an overview of the intersection of disability studies and philosophical ethics, Arguing about Disability is a truly interdisciplinary undertaking. It will be invaluable for all academics and students with an interest in disability studies or applied ethics, as well as disability activists. Biopolitics and bare life: Does the impaired body provide contemporary examples of homo sacer?